Tragedy in Eilat and Gaza: How Should We Respond? In the wake of yesterday’s tragic violence in Eilat and Gaza, I commend to you this wise and rational-minded statement from Jewish Voice for Peace. I would only add that I frankly think it’s remarkable, given Israel’s oppressive policies toward the people of Gaza, that we haven’t seen even more attacks such as this. To be sure, these kinds of incidents do not exist in a vacuum. History has shown us again and again that when people are oppressed, they tend to resist – often violently. And when it comes to the history of Gaza, this resistance – followed by overwhelming Israeli military retaliation – has been ongoing since 1948. Do not today besmirch the murderers with accusations. Who are we that we should bewail their mighty hatred of us? For eight years they sit in refugee camps in Gaza, and opposite their gaze we appropriate for ourselves as our own portion the land and the villages in which they and their fathers dwelled. This we know: that in order that the hope to destroy us should die we have to be armed and ready, morning and night. We are a generation of settlement, and without a steel helmet and the barrel of a cannon we cannot plant a tree and build a house. Dayan, to his credit, understood the true source of Palestinians’ frustration and rage. But I think he was tragically wrong in his belief that Israeli machine guns and bomb shelters would be able to keep their rage at bay – or that their military power would ultimately keep Israelis safe. Yesterday’s incident in Eilat is but the latest proof of this sad reality. It didn’t work then, and it’s still not working now. While I do not in any way condone Palestinian violence against Israelis, I do understand its source. And until these root causes are fundamentally addressed, I fear we’ll only continue to hear more tragic news such as this. This entry was posted in Gaza, Israel, Palestine on August 19, 2011 by Rabbi Brant Rosen. No one knows yet who did this but they are blaming Hamas who is usually willing to claim credit when they attack.They deny doing it..Israeli bombs have killed about 45 people since March this year. Since this incident 15 Palestinians are dead and over 40 wounded.Israel has attacked targets such as a library under constuction and crowded neighborhoods. ;a 2 year old and 13 year old are among the dead. It works both ways. If you understand their reasons for doing it, then you have to understand OUR reasons for hitting them. Two of the attacks were directed right at civilians from close range. 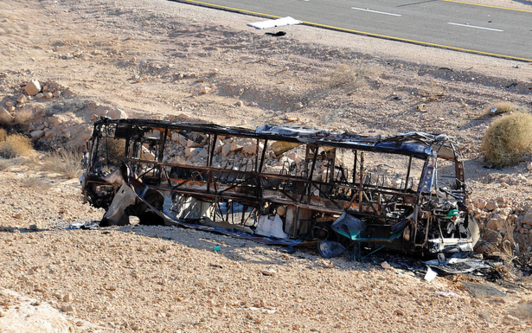 Just like the attack some weeks ago where a civilian bus was hit by an anti-tank rocket and a student was killed. Add to that the indiscriminate rocket fire they direct at us. Now, if they can do things like that, why can’t we bomb them back? Now you will say, “well, they are oppressed”. But we Jews have been mightly oppressed in the recent past and the Arabs have been continually attacking us in an organized way since 1920. So if they can hit us, why can’t we hit them back in the same way?. They want our land, we don’t want to give it to them. They claim we took their land, but they took OUR land centuries before, during the Arab/Muslim invasion of the Middle East, a totally unprovoked massive war of imperialist agreession, maybe the biggest in history. We offered them peace, they turned it down. They say it wasn’t enough, we say it was. Standoff. If they don’t want to accept the offers we made, the issue will be determined by whoever is the strongest in the long run, which will be us. They will be the losers, as is the case where the whole Arab world is falling farther and farther behind everyone else. It is time for them to get their act together. I beg to differ: These issues are not “determined by whoever is the strongest in the long run.” Oppressive empires rise, but history has demonstrated that they eventually fall. Putting our faith in military might help us win wars, but they do not ensure our continued survival. It was not for nothing that the Rabbis chose Zechariah 4:6 (“Not by might and not by power…”) as the Prophetic reading for Hanukkah – they understood that the Maccabees military victory was temporary, ill-fated, and ill-suited as a central message for the holiday. The Jewish people have survived while much mightier nations have come and gone. It is worth asking ourselves why this might be so. It is also worth asking whether Israel – an over-militarized, garrison state that retaliates with overwhelming fire-power when attacked – will ever find long-term security if it insists upon going down this path. I’ve never seen that Dayan quote — very telling in so many ways. Thanks for the opportunity to reflect on this sadness with some context. The assumption you are making that it is in within Israel’s power to make peace, which isn’t the case because the Arabs have made it clear they will never accept a Jewish state in their midst (and by “Jewish state”, I mean a state with a majority of Jews, regardless of whether this is a self-defined Zionist state or a “state of all its citizens” with the Jewish symbols of the state, such as the flag and the national athem removed). It is the Arabs who determine the nature of the conflict. I realize my statement that “the strongest will win” goes against most popular modern Jewish thought, as you have indicated…the reason I said it was to be provocative. But the horrors the Jewish peope faced in the last century, with thousands of Jews killed in the Russian civil war, the Holocaust and then Stalin’s attempt at a second Holocaust in the USSR in the 1950’s which fortunately was thwarted by his death, has shows that power, military and political are an important factor in survival, pure and simple. That is why a large number of Soviet Jews left that country and came to Israel in the 1970’s and 1990’s. Quoting verses from Zecharia which are interpreted as supporting Jewish passivity did not satisfy them. The fact is that the military victory is what is celebrated in the daily prayers during Hanukkah (the miracle of the lights is not even mentioned) and it is clear that almost all of the scholars who were around at the time of the ill-fated Bar Kochba rebellion supported it, and they were aware of Zecharia as well as we are. I reject your characterization of Israel as an “over-militarized garrison state”. Instead, I would define the Palestinian Authority and other Arab countries like Egypt and Syria by those terms. A high percentage of the Palestinian work force is employed by the numerous non-productive “security forces” the PA has and the other two countries have large military forces they really can’t afford to maintain, but which exist primarily for reasons of “prestige” and to intimidate the internal population of the country. No one is threatening their existence. Nobody in Israel likes the relatively high level of expenditures on defense, but as long as the Arabs reject Israel existence, Israel has no choice but to stay on the alert and to produce or acquire whatever military supplies and weaponry are needed. As I said, it is the Arab side who has defined the nature fo the conflict. I also want to emphasize what I stated in my previous column, that we do not accept justifications for Arab rejectionism that appear to be obvious to some other people.. We do not have guilt feelings for adopting the Zionist ethos, settling the land and proclaiming a Zionist state. If the Arabs can’t accept it, it is THEIR loss. If they can’t see the benefits of peace (I mean REAL peace, not the phony agreement that was signed by Egypt in 1979 which is on the verge of being abrogated by the Egyptian side) they will be the ones who suffer. The daily prayer during Hannukah thanks God for “the miracles, the redemption, the mighty deeds, and the victories in battle which You performed for our ancestors in those days, at this time.” A human military victory is not celebrated here, as one did not occur according to the theology of the prayer. In the theology of this prayer, all acts of violence and the victory in battle are attributed to God alone. What makes the rabbinic retelling of our history in the siddur so distinctive is that it attributes all of the military action to God and removes any hint of military action by the people. “I like Ike”: why not support your views with your real name? The ideas you express are so widely held in the U.S. and Israel that you need not fear being identified. Israel is a colony. The Palestinians will always be tempted to use force just as the Native-Americans did against the overwhelming might of the United States, another colonizing power, in the 19th century. Any such use of force is counterproductive because it plays to the strength of Israel – armed might – and allows it to cry havoc and obscure the grinding, daily oppression that it has maintained over the native people for the past 4 decades. Palestinians attacking Israel only prolongs the wait until Israel becomes a single state for two people. This single state is as inevitable as was the success of the Civil Rights movement in the United States. The facts are glaring and the world with the exception of the United States recognizes the injustice. But while Palestinian violent acts put back the coming of a single state, Israel’s relentless move to extremism brings it forward. Even with all the money and power of Zionism in the U.S., Americans can only swallow so much racism and oppression that operates on their money. Unbridled power not held to responsibility brings the arrogance that we see today in the actions of the Knesset. So between the one side putting off the date and the other bringing it forward, we have stagnation, suffering, tragedy. Could Cochise and Geronimo have been convinced to stop their men from attacking white settlers? No more easily can the rocket attacks be ended. Who won the war between the “colonizing” white men and the Indians? The white man because he was stronger. Israel will win if it is the stronger, if we become weak we will be wiped out, G-d forbid. Your concern about the “racism” of Israel is misplaced, there are many other worse examples of racism and ethnic cleansing that no one, including you, cares about. For example there was the Turkish invastion of northern Cyprus which lead to 300,000 Greek Cypriots being expelled. I have never seen any American Jewish progressive groups ever mention anything about it even though as American citizens they could have groups for pressuring the US government which is allied with Turkey in NATO. Then there were the 40,000 Kurds killed by the Turks in the last 20 years, and the war there is heating up. Again, nothing ever mentioned about it by American Jewish progressive groups. Then there is the massive state-sanctioned violence in that ethnocentric Muslim state called Pakistan where various minorities such as the Ahmadis, the Shi’ites and Baluchis face harsh repression and violence (again, it is state-sponsored or state sanctioned). The US gives a tremendous amount of aid ot that state, yet I haven’t heard American Jewish progressive groups say a word about it. If American Jewish progressives can look the other way at racism and violence in various countries, they can get used to the Israeli-Arab conflict where Israel is not nearly as guilty of whatever crimes they seem to think they are. Your goal was to expose the hypocrisy of progressive Americans, which is fine–but that’s a two-edged sword. Re Progressive Americans: many are as fundamentalist in their POVs and beliefs as those they accuse of fundamentalism on the other side of the aisle. But, they refuse to acknowledge that this is the case suggesting that they alone hold the moral high ground. I would like to clarify the point that Jordan made. To me “racism” is a deliberate humiliation or subjugation of a people based on ethnic lines, although people do seem to use in the context of religious or other form of group identification as well. I would reject the claim that Israel is “racist” based on this definition of the word. However, it is common today to use the world “racism” to apply to ANY form of distinction between groups of people . Israel, being an “ethnocentric” state is therefore defined by many Progressives as being inherently “racist” on this basis. Okay, so be it. My point is that even if we accept this (ridiculous, to my mind) definition of racism, thus making Israel fall into the category of being a “racist” state according to Progressive thought, these Progressives turn a blind eye to countless forms of racism in other countries which any reasonable person would say is far more egregious than anything Israel does regarding its Arab population. Thanks for the responses, Jordan and I-Like-Ike. I was indeed lumping “racist” and “ethnocentric” together in the rather loose way that many of us do. Perhaps I was picking up on the reference to white men vs. Indians at the start of his comment. As for the “inherently violent,” I took that from his opening comment about white men and Indians as well. If “necessarily” or “inevitably” strikes you as more positive than “inherently,” please feel free to substitute it–after all, as the rest of the post demonstrates, states that are founded on the rule of a particular group (racial or religious or ethnic) seem bound to use violence to defend that rule at some point, if only by expelling threatening populations of others. The horrors that accompanied Partition in India and Pakistan would be one example; the horrors that dismantled Bosnia would be another; the list goes on. To maintain rule by group X, you have to make sure group Y doesn’t outnumber or outgun you. That doesn’t have to be in a violent way; as Lieberman suggests, you can redraw your borders–a bit like gerrymandering in the US, I guess, on a more radical scale. But in the long run, I think there’s a fundamental violence in the premise that a state exists for some reason other than to enact and defend the rights of its citizens, whoever they may be. To my ear, the gist of the comment was “Israel’s like Pakistan / Turkey / etc., but not as bad, and you don’t complain about those, so stop criticizing Israel.” To which I’d say simply, Israel claims to be The Jewish State, and I’m asked to support and embrace it as a Jew. But I’m also a progressive American, and a Jewish Pakistan? Well, it’s hard for me to get particularly worked up on behalf of that as an ideal. Much more comfortable with the ideal of secular, multicultural democracy, whatever its risks. Thanks for the thoughtful comment. Yes, I have NO problem with Israel being an ethnocentric state, as long as the rights of minorities are guaranteed which is more or less the situation, with some room for improvement. Yes, we Jews in Israel are calling on you embrace Israel (it is important to remember that American Jews need Israel more than Israel needs American Jews-support for Israel in America FAR transcends the American Jewish community and predates it by many decades), but you are also a concerned American citizen and a voter. What the US is doing in Pakistan, and its relations with NATO ally Turkey involves responsibility on the part of you and other American Jewish Progressives as well. The US supports ethnocentric states all around the world, particularly in the Middle East where to the best of my knowledge all Arab/Muslim states define themselves in ethnocentric terms, so to fixate on Israel, particularly those involved in BDS campaign, without also encouraging DIRECT involvement in the American policy regarding these other countries strikes me as representing a double-standard. Ike – you seem to feel that “who won” is justification, in other words that might makes right. There is no exclusive right of any one group to any part of the planet, and Jews were not prohibited from moving to Palestine before Zionism. The United States is rightly ashamed of the treatment it gave Native-Americans. Humanity has learned the folly of exclusivity over the centuries. Israel is a last try at might makes right, using the same old mythological reasoning that so many have used before while passing over the fact of residence for the Palestinians. Israel is instructive because it shows that overwhelming power can hold the fort – but not indefinitely. The founders of Zionism had their dreams at a time when forts (colonialism) were being held and even expanded at the expense of the powerless. They imagined a fort for themselves as a real long-term possibility if only they could drive out the residents of the place where they wanted that fort to be. They were acting as humans do when they weight what they want to obtain with what others stand to lose. The balance beam slams down in one direction every time. So Israel as an exclusive state has no future because it is an anachronism out of keeping with the zeitgeist. The world knows the futility of such efforts from painful experience. Only the horror of the Holocaust gave Israel the chance to make the final play for exclusivity on a microscopic scale. The “Final Solution” issued the free-pass to the final try at exclusivity. Yet as Isreal appeared to surge, the colonial empires crumbled everywhere. Now Israel stands alone and starkly so. The free pass is expiring, tattered and stained with the injustice that it has allowed for over 6 decades. Far from trying to ameliorate injustice, as the U.S. did by allowing Native-Americans full citizenship, and passing the landmark act of 1964 that swept away the European bias on U.S. immigration, Israel only moves ever further into arrogance and edicts, dispossession and self-righteousness, shrill denunciation and breathtaking claims of sole possession to new arrivals who must be Jews. The ugly reality of exclusion is on daily display from the uprooting of Palestinian cemeteries, to the demolition of the Lifta ruins to the stacking and packing of virtually destitute native human beings in Jerusalem. The world looks on as brother Jew oppresses brother Palestinian. The former makes a unique claim based on the practice of a religion in common with ancient residents, while the latter make a claim based on what everyone in the world recognizes as legitimate – actual residence over time. There can only be one outcome – one land for two people. All that is in question is the toll before that day arrives. Thanks, ILI52. I’m not sure that “American Jews need Israel more than Israel needs them”; my hunch is that neither needs the other quite as much as we think. Impossible to test, I suppose. As you’ve said here before (I think it was you), situations like this can last a very long time, as they do in Kashmir and elsewhere. I don’t think there’s a radical change in the current situation in the cards for any time soon. The really interesting question for me at the moment is whether the “two states for two peoples” slogan catches on with progressive American Jews, or whether it will ultimately sound too much like “separate but equal” to take root, so that some kind of “state for all its citizens” idea takes hold instead, whatever the boundaries of that state might turn out to be. Some historical perspective-There were severe restrictions on the Jews who moved to Eretz Israel before Zionism. Up until the 1850’s (IIRC) they faced the dhimmi restrictions of the Muslim Ottoman Empire including the jizya tax. During the British Mandate period the British authorities ended up almost completely banning Jewish immigration and land purchases by Jews. Things were so good then. Regarding Israel being out of touch with the “zeitgeist”, I should point out that this not necessarily true. The “zeitgeist” you are referring to exists primarily in Western Europe and North America. Who says this is the only standard for humanity to follow? After all, Europe is in decline with a below-replacement birth rate and long-term economic stagnation. The US is also in a state of long-term crisis. Why should you assume that they are the wave of the future? In the Middle East, the so-called “Arab spring” seems to be moving in the opposite direction….more Islamic influence in government, more nationalism, less “multi-culturalism”. Everyone praises Turkey for supposedly being a Muslim democracy, yet they are increasing the repression against the Kurds. They certainly don’t view multi-culturalism as any sort of ideal in their country. Yet, as I stated above, I haven’t heard ANY complaints from Progressive American Jews about their own American’ government’s policies towards this important NATO ally. When I saw your first comment, I clicked on to your Shomer Shalom site, which I was not aware of previously. I came across an article, written by someone whose name I did not catch, who stated something to the effect that this “nationalism-state” thing was a thing of the past and mankind was moving beyond that, so it was time for Jews to forget about Zionism. I think he is talking to the wrong audience…did it occur to him that perhaps Israel would be doing the Palestinians a favor by NOT giving them a state? Here is the perfect opportunity to teach the Palestinians that nationalism is not the way to go and they can then serve as a vanguard for the rest of the Arab/Muslim MIddle East in moving into the Brave New World reflected by the “zetigeist” you mentioned. I hope that the “zeitgeist” is moving toward democracy which means “consent of the governed” is some form or another. Whether this is case or not only time will tell. The concern I have with the situation in Israel is that it is my belief that they are acting unjustly toward the Palestinians. This is the reason that many progressive Jews are critical of Israel. The fact that other countries are doing worse doesn’t seem to be all that relevant in my opinion. After all how would you criticize anyone? – there is always someone doing worse. So my question is “Does Israel act unjustly toward the Palestinians?”. Maybe you think they don’t. However if you think they do isn’t reasonable to criticize them for it? Ike – there is quite naturally a reactionary movement against multiculturalism, just as there was fanatical opposition to integration in the United States. But there is no going back that way simply because nationalism by restriction doesn’t work. Norwegians are not flocking to the banner of Anders Breivik and each act of rightist extremism not only shows the heritage of such ideas as his, but the future if they were followed. Such acts are signs of desperation. Not to say there isn’t plenty of racism and cultural conflict around, only that a return to ethnic purity isn’t taken seriously as a course to follow. It’s the rejection against the move to the right that is turning young American Jews away from Israel…they see the stature of the religion debased by the “facts on the ground” that are a repudiation of the remarkable record of Jews in the Enlightenment and before. Is Netanyahu more closely related to Maimonides or Francisco Franco? The Ottoman Empire lasted as long as it did thanks to its toleration of all segments of society. It was the inability of the Ottoman system to keep up with the technological/Capitalist program of Europe that doomed it, with all the major powers salivating to rush in for the colonial kill. The experience of the Jews in Europe, the Armenians in Turkey and the Kurds in several states are not held up as worthy of emulation but awful examples. The great awakening of modern society is in the realization of the golden rule. Martin Luther King, Jr. is not hailed only in the United States. Eugenics and racial pride have had their day and the success of people of all races has made the routine racist remarks of the 19th century embarrassing to read. The speakers thought they were speaking from a position of greater intelligence. We know now that it was blind ignorant bigotry. Edward Said put the case perfectly for the more modern and milder versions in his book, Orientalism. Something has been learned that cannot be unlearned, though slaughter is always an option. You can claim that moving backwards is the way to go – this is what Israel seems eager to prove, but there is no denying great progress has been made in inter-ethnic relations – hence my use of zeitgeist.